Offer the worlds’ easiest way & fastest speed to instantly download YouTube video on Mac for offline watching! Being the largest video-sharing website on the Internet around the world, YouTube offers the most videos online in various themes, like music, sports, gaming, education, movies, TV shows, news, live shows, etc. People could do far more than only watching videos on YouTube, but also upload and post clips or videos of their life, and download various online YouTube videos to computer or portable media players like iPhone or iPad for offline YouTube video enjoying. However, downloading YouTube videos on Mac would be some kind of tough task for most people as YouTube itself doesn’t offer the video downloading channel for all users. To download YouTube videos on Mac, a Mac YouTube downloading app is a must have. Leawo YouTube Downloader for Mac is just such kind of Mac YouTube video downloading software program. It could easily download YouTube videos and convert YouTube videos to multiple video formats like MP4, AVI, MOV, M4V, MKV, 3GP, etc. for various media players. Download online videos on Mac from YouTube, Facebook, VEVO, Dailymotion, Break, Veoh, Metacafe, LiveLeak, Aol, TED, BlipTV, VideoBash, Funny or Die, GodTube, eBaum's World, etc. Convert online videos on Mac computer to various formats like MP4, AVI, VOB, FLV, MOV, MPG, WMV, MKV, 3GP, 3G2, etc. 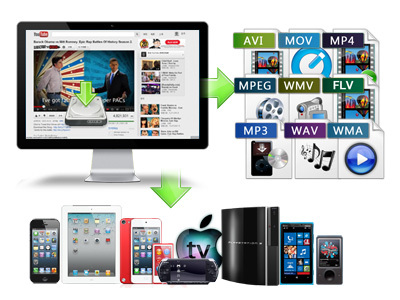 for different media players like iPhone, iPad, Android phones, Windows Phones, etc. Convert online videos to videos/audios in diversified formats with parameters adjustable, including: codec, aspect ratio, frame rate, bit rate, sample rate, channel, video size, etc. Barcody makes creating barcodes a piece of cake. Create barcodes series in no time. Print barcodes on label sheets. Barcody supports different barcode types. Send barcodes via email directly from Barcody. Many others can create barcodes. But Barcody makes creating barcodes a piece of cake. And thanks to LinkBack technology you can not only place barcodes from Barcody easily in iCalamus, the Publisher for Mac OS X, but also change them directly in Barcody and update them in iCalamus documents very easy. A link is a reference to another place. A backlink is a reference back to the source of an object. The LinkBack technology offers all necessary steps to let a program like iCalamus, the publisher for Mac OS X, recognize when you have placed objects from a LinkBack supporting program like Barcody in a document. When you select such an barcode object, iCalamus "knows" that the object originates from Barcody and iCalamus can call Barcody for you, handle over the object to Barcody for editing and update the barcode in the document immediately after you have saved changes to the barcode object. Barcody is available in: English, Czech, Danish, Dutch, French, German, Italian, Japanese, Spanish, Swedish (and counting). Click to Barcody Site for more info. DSD.net is the distribution center of Dunkel Software Distribution and invers Software. Dunkel Software Distribution, has since 1996, been known as invers Software. Developer and distributer of the DTP system Calamus SL and iCalamus, and many other great software applications beyond the mainstream. Software merchant Ulf Dunkel was co-editor of the German DTP magazine 'invers' (now supplement of 'Publishing Praxis') and is well-known in the DTP scene for many years, now offering software beyond the mainstream for different platforms and systems. MK-Software develops tools for Mac OS X since Summer 2002. Some of these are Barcody, Charmas, Jobtimer, Notio and StartUp. Michael Kammerlander (MK Software, Kirchlengern, Germany) is a well-known Calamus developer who has created a variety of modules for this legendary desktop publishing system. He is busy in web design and internet programming, too. He is one of the decisive developers of iCalamus, the new publisher for Mac OS X.
Mac OS X 10.8 (Mountain Lion) or higher.